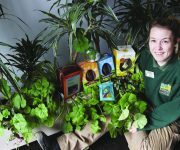 DZG is urging people to think eggs-tra carefully when buying sweet treats this Easter and say no to palm oil. 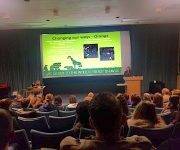 Concerned keepers at Dudley Zoo say many chocolate eggs contain unsustainable palm oil which devastates the habitats of wild cousins of our two Sumatran tigers and four Bornean orangs. They say we should check the ingredients labels … Continue reading Choose eggs-tra carefully! 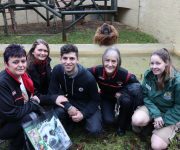 Our newest keeper, Deb Pittaway, has completed her first summer season at DZG! 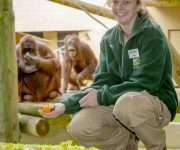 Deb, aged 35, has joined our Upper Primates team from Twycross Zoo and has started her duties working alongside our four Bornean orangutans, Benji, Jorong, Jazz and our cheeky youngster, Sprout – just look at the face the six year-old is pulling … Continue reading Deb’s first DZG season! Whooooooo! We’re gearing up for Hallowe’en and all getting into the spooky spirit here at DZG – orangutans included! 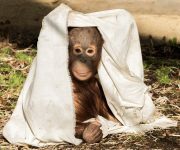 Our great apes are all playful primates who love making up games with whatever they can get their hands on, so we’re renewing our plea for unwanted pillow cases, duvet covers, clean sheets and towels, which can … Continue reading Spooky Sprout’s sheet shoutout!